329 YEAR OLD CARTOON IN DUTCH MUSEUM ANGERS TURKS, RIJKSMUSEUM ‘DISTANCES’ ITSELF FROM THE DRAWING…… – The Tundra Tabloids……. File this one under “Whining Muslims”. You see, no Muslim or anything Islamic can be seen in a less than flattering light, for long, especially by the hand of a non-Muslim. This is a sharia based concept. What the Dutch museum should have done, was to tell the whining Turks that it’s part of history and will remain in the exhibit, and grow up. Remember folks, the Turks are the ones who are saying that they are ready to join Europe, and then prove themselves not to be ready, if ever. NOTE: Mehmed IV was from 1648 to 1687 the Sultan of the Ottoman Empire. His reign of the Turkish Empire was a short, abruptly coming to an end with the battle of Vienna. The koran is seen lying on the floor at the foot of the bed next to the portable ‘royal commode’. MSTERDAM, 12/04/12 – The Rijksmuseum in Amsterdam is distancing itself “from the significance” of a cartoon from 1683 which it is currently exhibiting. A furore arose in Turkish media. The print shows the Ottoman sultan lying sick in bed after losing a pitched battle by Vienna. A remarkable detail is that the royal commode is beside the bed with the Koran next to it as toilet paper. Such prints were popular in Europe after the Ottoman defeat in the siege of Vienna. Wim Pijbes, director of the Rijksmuseum, has meanwhile placed an explanatory text beside the print. 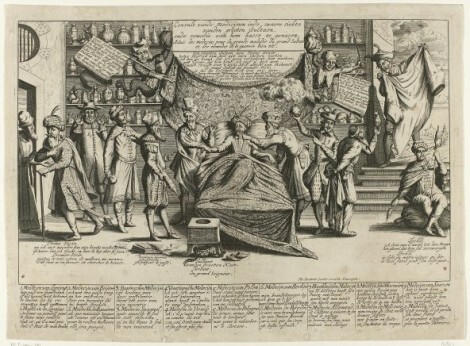 This says that such a print is part of the full picture that the museum wants to give of 400 years of Turkish – Dutch relations, but that “this does not mean that the Rijksmuseum endorses the meaning of the print.” Pijbels says the text was necessary to prevent escalation. Previous Post Previous Post SOMALI SUSPECT IN FINNISH TERRORISM CASE RELEASED FROM CUSTODY, ORDERED NOT TO LEAVE FINLAND……..
Next Post Next Post KING OF JORDAN WANTS FULL DIVORCE FROM THE PALESTINIANS……. Another example of the castration of Europe!